For Carnegie Mellon University’s Edda L. Fields-Black, every grain of rice tells a story. From her first monograph, “Deep Roots: Rice Farmers in West Africa and the African Diaspora,” to the multimedia project, “Requiem for Rice,” the tiny seed is the centerpiece of her work. Fields-Black’s interest in West African rice farmers was partly influenced by her ancestors’ Gullah Geechee heritage. While studying the language and culture of her grandparents and great-grandparents, she discovered that rice cultivation and consumption linked the Gullah Geechee to residents of West Africa’s Upper Guinea Coast, who later became slaves in Georgia and the South Carolina Lowcountry. Curator Paul Gardullo met Fields-Black in 2013 when she was a senior fellow researching the Gullah Geechee at the Smithsonian’s National Museum of American History. He later relied on her expertise as an adviser at the new Smithsonian National Museum of African American History and Culture, which opened to the public in September. Fields-Black helped him develop “The Rice Fields of the Lowcountry” for the Power of Place exhibit. Power of Place is one of 12 galleries in the museum – the only national institution dedicated to documenting African American life and history. Fields-Black said that working with its curators exposed her to new storytelling methods. 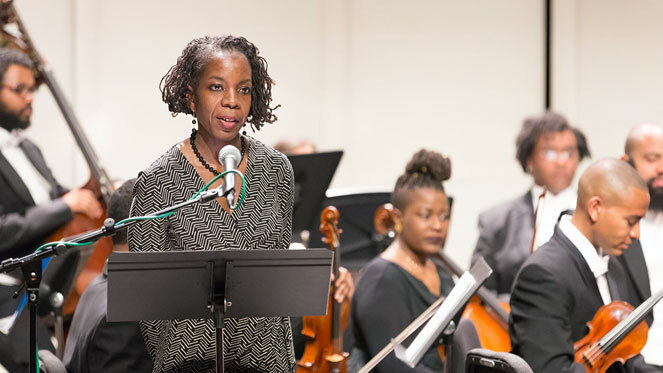 The experience informed her ongoing work on “Requiem for Rice,” a tribute to slaves on southern rice plantations performed by a full symphony orchestra and choir. The requiem will also incorporate classical West African dance, drumming and singing. Fields-Black is completing its libretto and is collaborating with filmmaker Julie Dash, painter Jonathan Green and composer Trevor Weston. In January, Fields-Black will begin a Senior Ford Foundation Fellowship at the College of Charleston’s School of Languages, Cultures and World Affairs. During the fellowship, she will collaborate with CMU’s CREATE (Community Robotics, Education and Technology Empowerment) Lab on a digital humanities project that involves upgrading the “Requiem” website with interactive and mobile features. She is excited by the potential of the new site, which will allow the public to experience living in a slave cabin, working in rice fields and the June 1863 Combahee River Raid led by Harriet Tubman. The entire “Requiem” project began as part of CMU’s Center for the Arts in Society’s (CAS) Performance Initiative and will debut next fall at the annual Colour of Music Festival in Charleston, South Carolina. In addition to these projects, Fields-Black is actively involved in CMU’s Department of History. She is currently teaching a freshman seminar on the slave passage and a graduate seminar on the African diaspora. Alumna Jessica Wallach touched on these topics and more in her student-defined major in African Studies. Pictured above is Edda Fields-Black performing “Requiem for Rice” at the Colour of Music Festival Virtuosi. Photo credit: Renee Rosensteel.